Today I have the pleasure of having Brenda Howson and Melissa Pearl blog touring at Parchment Place! These two amazing women have co-authored a new adventuresome YA book set in the stunning and idyllic south of New Zealand. This is a big welcome to both Melissa and Brenda. If you would like to follow the tour – please visit here. 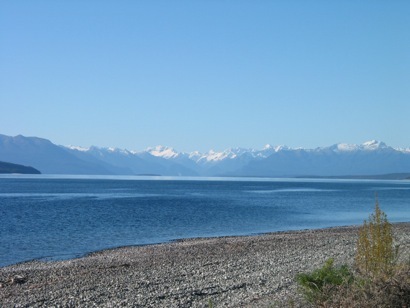 Why did we choose Te Anau as the setting for our book? Wow, that’s stretching the brain cells. Before kids, Melissa and I (plus our hubbies) went on a series of trips in campervans (SOOOO MUCH FUN!!) We travelled almost the entire South Island of New Zealand over three different trips. Anyway it was on one of these trips that the Mica and Lexy series was born. We needed to pick a town that was small, surrounded in bush and interesting. We stayed in Te Anau on our first trip and fell in love with it. The town is cute and right on the edge of the lake. It’s only a stone’s throw away from several hiking tracks and most importantly the densest forest and bush in New Zealand. Somewhere that Mica and Lexy were bound to get in trouble. Originally we wrote the books for fun. I’m not sure we intended on publishing them (do you remember Melissa?) but they just kept evolving and developing into something really great, which made us rethink. 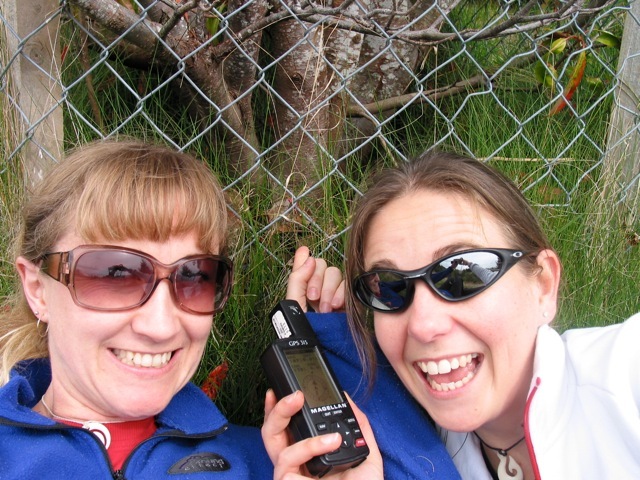 In 2005, after we had finished book 1 and 2, Melissa and I decided we’d better take a trip back to Te Anau to make sure we had got all our facts right. We flew and drove down (7-8 hours driving from Christchurch) and stayed in a cute little Holiday Park right in the centre of town and explored everywhere. The road we had imagined the girls lived on was so similar to our imagination it was spooky. We wandered around the school, around the lakefront and spent some time walking on some of the forest tracks to get a feel for the bush and the terrain. We even took a GPS and did some geo-caches! The trip was awesome fun and we’ve even started talking about going again (shussssh don’t tell our husbands). Here are a few pics from our adventures. We were feeling a bit silly and girly, hence the funny faces! You can purchase this awesome book from Smashwords and Amazon. Here is a little more information about Melissa and Brenda. Follow them, Tweet them, and visit their blogs. I’m sure they will welcome you all with open arms! Melissa is the author of the Time Spirit Trilogy, which was published at the end of 2011. She is a fully trained elementary teacher, but is lucky enough to stay home and watch her kids grow. She is also spending every spare moment trying to turn writng into a full time career – and loving the process. Brenda was the one who encouraged Melissa to start writing in the first place. Once Melissa got started, Brenda caught the bug and she has been writing for ten years, in between motherhood and working at a local high school in the computer department. She has won two short story competitions and been runner up in another. Forbidden Territory will be her first published novel. Well thank you for writing such an awesome book! Can’t wait to read more in the series! Get writing! Next ArticleUp, up, and away!